Forty Toes: Mattie Boy Boutique Giveaway! Use code FORTYTOES for 40% HERE! Watch your child's eyes light up when they wake up Christmas morning and find their very own Personalized Santa Sack waiting for them by the Christmas tree! Fill the sack with one big gift or a few small gifts. 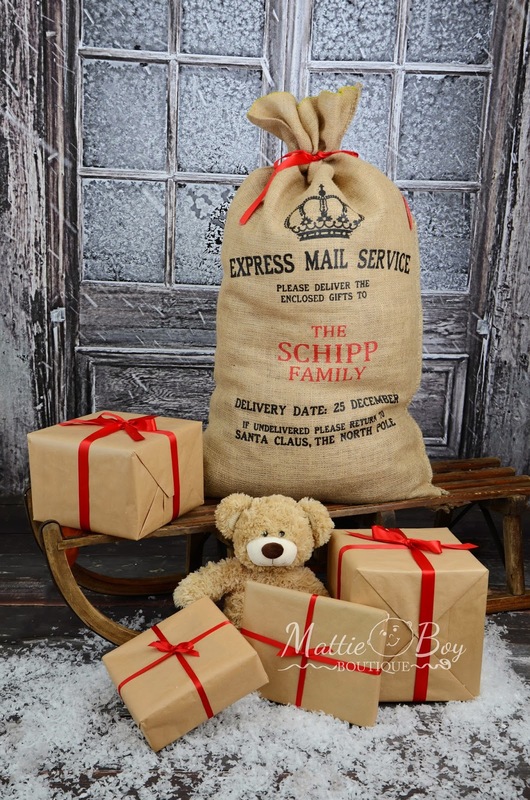 This sack can be used year after year and will make a perfect keepsake. Bag is made from hydrocarbon free burlap and measures 24" x 40". Each bag has been hand screen printed and your child's name will be stenciled on in red fabric paint after your purchase. Bag does not have a drawstring closure, but comes with a red satin ribbon tie.I can personalize your Santa Sack with a first and last name or with a family name, for e.g. "John Smith" or "The Smith Family".